Visit Zihuatanejo and know its beautiful beaches, some of the best in the entire Mexican Pacific, you can stay in the most luxurious houses or villas for your comfort and your family, in the following list you will find, not all, but the best and More luxurious homes and villas in Zihuatanejo and the most visited and recommended for an unforgettable vacation, click the button More information and contact directly to make your reservation. Located just 1/2 block from beautiful La Ropa Beach, this small, quiet condo complex has 24 hour security, a large pool, green area, and a full time manager on-site. The condos, which accommodate from 2 to 6 persons, are full equipped, air conditioned, and lovingly decorated by individual owners. 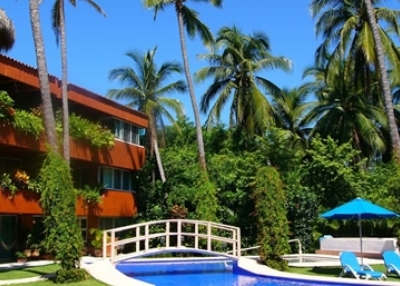 Solana Boutique B&B is a seven room hotel set amidst lush tropical jungle overlooking the beautiful Zihuatanejo bay. Our suites are designed as your own oasis with a private terrace, open air shower, hammock and stunning bay views. With soothing natural colors, wood accents and a sophisticated modern Mexican design, Solana is the perfect place to take a break from the modern world and find the space to breathe again. Unique, exclusive and luxurious hotel, experience one of the world's best 8 suites hotel located in Ixtapa - Zihuatanejo, Mexico. Explore and savor the stunning panoramas in the hotel and nearby ( wild blooming flowers, green lush hills, gardens, ocean views, white sand beaches) don't think the romance has gone from your life. 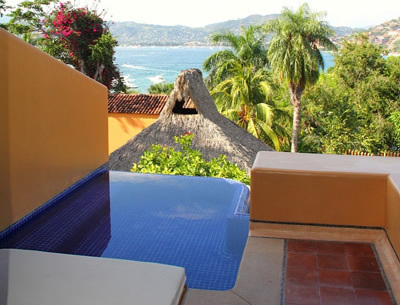 It's just about to begin in our small luxury Hotel Casa Don Francisco in Zihuatanejo, Mexico. Represented by Francisco Ibarra Rivera and his family. 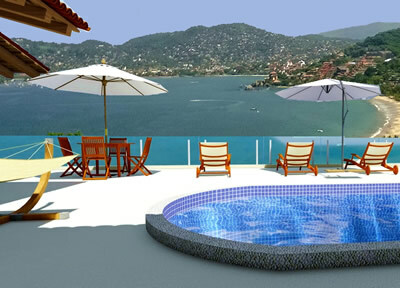 Relax and enjoy your vacation in the tropical paradise of Zihuatanejo, Guerrero, Mexico. 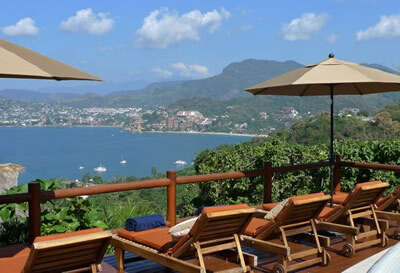 Situated on a hillside with a magnificent panoramic view of Zihuatanejo's beautiful sheltered bay, Punta Marina Villas are perfect for that tropical getaway vacation you have been planning.